The game features music from artists in earlier DJ Max games, such as Croove, NDLee and Tsukasa, as well as new artists such as Laurent Newfield and TANUKI. As songs play, musical notes will scroll across the screen and players are required to touch each note as the line crosses them, in sync with the rhythm of a song. There are a number of different types of notes in the game, and each type is played in a different manner. During game play, a 'fever meter' builds up as notes are successfully played. When the meter is full, players can activate 'fever mode' in order to increase the score value of each note for a limited duration of time. The 'groove meter' will decrease if any notes are missed, and once empty, the player fails the song and the game concludes. Star Mixing: A single player mode with normal difficulty. Players choose three songs to play and each song uses only three rows of notes. Pop Mixing: A single player mode with hard difficulty. Players choose three songs to play and each song uses four rows of notes. Club Mixing: A single player mode with maniac difficulty. Players choose three songs from a limited selection of songs using four rows of notes. A fourth song is then determined based on the player's performance. Crew Race: An online game mode with various difficulty. Players compete against computer-generated scores and challenges. Crew Challenge: An online game mode with various difficulty. This mode features Crew Missions (cooperative games where players can earn rewards), Challenge Missions and Special Missions that include competitions and events. 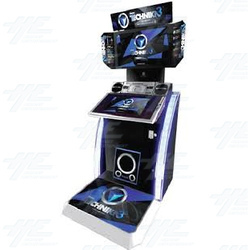 DJ Max Technika 3 continues to use the 'Platinum Crew' service for online play and rankings. Players can record their scores and gather MAX points by saving data on a player IC card. MAX points can be used to purchase additional songs, effectors, DJ icons, notes and emblems.